In this week's blog, I want to talk about God's law and its role in the life of every believer. Now before I go any further, I want to be completely clear in communicating that I am not talking about a bunch of do's and don'ts that try to establish a righteousness by good works. Every believer should know that the finished work of the cross secured a righteousness for us through grace that obeying the law could never do (Romans 6:14; Ephesians 2:8-9) and that it is impossible to attain right standing with God apart from what Jesus did in our behalf (Galatians 2:21). Having said all that, it important for us to be reminded that freedom from the law does not mean lawlessness. The Apostle Paul wrote that just because we are set free from the law of sin and death (Romans 8:2), we are not to continue to sin with the intent of seeing grace abound (Romans 6:1-2). In Galatians 5:13, Paul also reminds us that we are not to use our new freedom to indulge our flesh but to love and serve one another. Though we are freed from the written law that Jesus fulfilled when He became a curse for us on Calvary's tree (Galatians 3:10-14), we are now called to a higher plane of living where the royal law of love (James 2:8) is our greatest aim (1 Corinthians 14:1). It is in this place of loving others in the same way that the Trinity loves us (John 15:9) that we will begin to see that love really is the fulfillment of the law (Romans 13:8 / Galatians 5:14). When we live by the law of love, every other written code pales in comparison. No longer are we trying to manage an external bunch of rules and regulations because now we are being governed by a goodness that has been grafted into our own heart. I am writing this week's blog because sometimes even the mention of the word 'law' causes some dear folks to have a fit. In a world where absolutes are being called into question, I think it is important for us to remind ourselves that God's law is constant even in the midst of an ever changing code of conduct in society. Could you imagine living in a civilization where truth would become so subjective that many of our most basic laws would be thrown out the window? How safe would you feel if people were free kill, steal, lie and plunder their neighbors possessions? The reality is that even those who are the strongest advocates of deconstructing absolutes, would want the basic absolutes still enforced (don't kill, steal, etc) so that they could feel safe. When God originally gave Israel the Ten Commandments, they were meant to give the entire nation a peek into what He really values. Because God doesn't murder, He told the Israelites... 'Thou shalt not murder'. Because God doesn't steal, He told them... 'Thou shalt not steal'. Because God is faithful, He said 'Thou shalt not commit adultery'. And so on. I believe that the more we can see the Ten Commandments through the lens of the New Covenant revelation of God that Jesus showed us, the more we will see a glimpse of love's description from 1 Corinthians 13:4-8 within these commandments. In Romans 7:12, Paul writes that the law is actually holy, righteous and good. It is just that we were too weak and powerless to fulfill its righteous requirements (Romans 6:6-10). That is why we needed a champion from heaven to do for us what we couldn't do for ourselves. 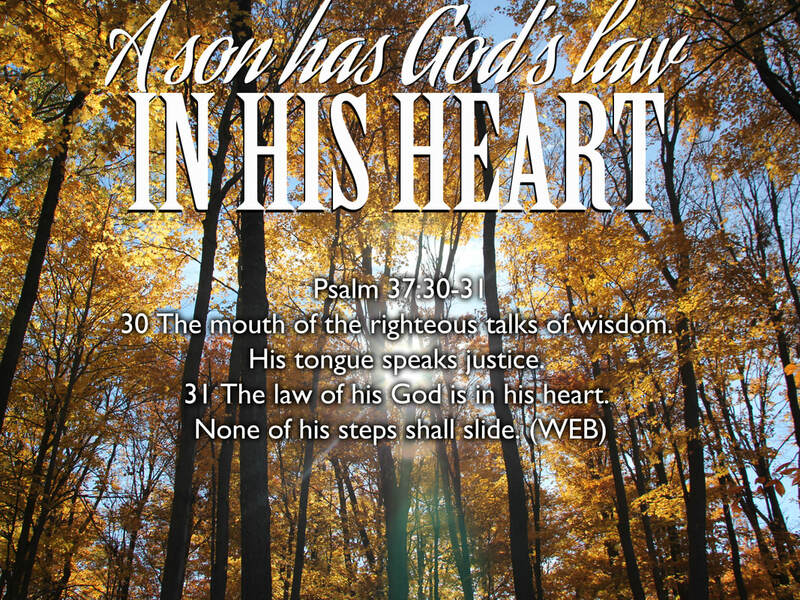 My prayer today is that Papa would give us all a right understanding of His law that is written in our hearts as opposed to the evil, legalistic law that serves only to kill, steal and destroy. I pray that every person who has been wounded by an inappropriate application of God's law would experience the healing that only love can bring. I pray that the law of love would overshadow every other external religious influence that governs through fear, shame and intimidation. May the revelation of God's unmerited favor (GRACE) set us free from any of our legalistic mindsets that would try and enslave us so that we could start trusting the good and noble heart that He has given us. And lastly... May we all awaken to the fact that our God and Father has written His law on our brand new heart and it is through our heart that He leads and guides us (Philippians 2:13) to do the good works that He prepared for us to do (Ephesians 2:10).